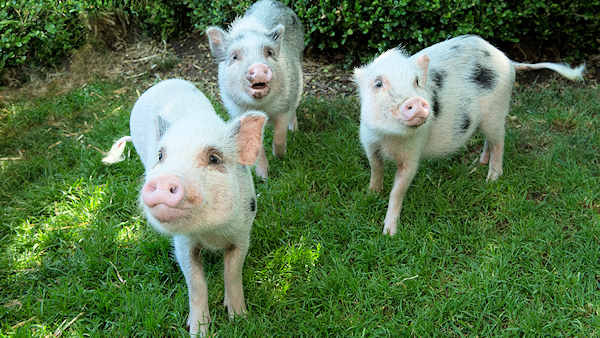 PROSPECT PARK (WABC) -- Three Juliana pigs are making their public debut at the Wildlife Conservation Society's Prospect Park Zoo. The young trio, two males and one female, are siblings. Their arrival is a first for the Prospect Park Zoo, which has not previously exhibited pigs. Juliana pigs are surprising in stature. They are the smallest breed of miniature pig, weighing less than 65 pounds as adults - a fraction of what a standard-sized breed would weigh. With their colorful spots, Juliana pigs are also known as miniature painted pigs. Juliana pigs are known for their wonderful temperaments, curiosity and intelligence. At Prospect Park Zoo, the new pigs are on exhibit alongside goats, sheep, chickens, and other domestic animals in the barn area. The Wildlife Conservation Society's Prospect Park Zoo admission fees are $8 for adults, $6 for seniors 65 and older, $5 for kids 3-12, free for children under 3. Zoo hours are 10 a.m. to 5 p.m. weekdays, and to 5:30 p.m. on weekends and holidays, April through October, 10 a.m. to 4:30 p.m. November through March. The Prospect Park Zoo is located at 450 Flatbush Avenue in Prospect Park, Brooklyn. For further information, call 718-399-7339 or visit ProspectParkZoo.com.